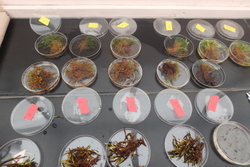 Petri dishes filled with moss and liverwort samples. Toolik Field Station, Alaska. Photo by Svea Anderson. Ecosystems develop and change through interactions between living things and their physical environment. A shift in vegetation is one of the most important changes an ecosystem can experience, because it can alter exchanges of energy (originating from sunlight), water, and elements such as carbon (C) and nitrogen (N) between air, plants, and soil. In the Arctic, a widespread shift from tundra to deciduous shrub-dominated vegetation appears to be occurring. This project will assess contributions of different shrub feedbacks to carbon and nitrogen cycling, and improve predictions of the consequences of shrub expansion in the Arctic for regional and global climate. 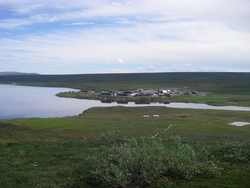 A view of Toolik Field Station, Alaska. Photo by Catherine Campbell. The research team will be based out of Toolik Field Station, an 8-10 hour drive north from Fairbanks, Alaska. Toolik Field Station is operated by the Institute of Arctic Biology at the University of Alaska Fairbanks and has hosted hundreds of researchers and students every year since 1975. The team will drive to an additional field site ninety miles north of Toolik Field Station. Timely article. I hear that a boatload of produce is grown at Chena. Nice photos! I'm looking forward to following your adventure! Great images from our field trip. What was your favorite part? Kate, you are set for an adventure. You will have fun in Toolik and remember the expedition always. Enjoy!